Q1: How do I pay for purchases? A1: Currently we only accept these Credit Cards: Master, Visa, Amex and Discovery. Payment can be done via Paypal but youare required to own a Paypal account to use it. Just enter your credit card details as with any other online purchases using credit cards. 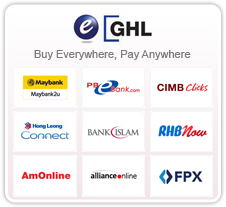 We also accept the use of E-GHL for internet banking purposes, with acceptable services such as Maybank2U, CIMB Clicks, Hong Leong Connect. RHB Now, Bank Islam Online, PBeBank and Affin Online. Q2: What is the cost of the shipping fees? A2: To find out how much the shipping will cost, add the items you are interested in, to your shopping basket. Note that in doing this, you are not obligated to purchase these products. When viewing your shopping basket, you will see an option called 'Check Out'. When selecting this option, you will be forwarded to the 'Shipping Information Page.' Please enter your shipping details and your shipping charge will be calculated and shown. Q3: When can I expect my orders? A3: Normally we will ship your orders within 3 working days upon confirmation of payment. However, some items are required to be ordered from oversea and require longer lead time. We will inform you should the goods are not able to be shipped out within 3 working days. You will receive an email notification with shipping tracking code once we have shipped out your purchase. Q4: What happens if the ARMS Store cannot fulfil my order ? A4: In the event that the ARMS Store cannot fulfil your order, we will notify you as soon as possible and offer several other purchase options such as: full/partial refund, equal value exchange, order amendment/cancellation, etc. Q5: Which courier service are you using? A5: We use either Citylink or Poslaju.